Do you remember the song from Calamity Jane that says---"Oh, everyone complains about the weather, but nobody ever does anything about it!" The weather has been a hot topic lately, but we thought we would talk about other hot topics at the quilt store! Nicole just finished this adorable tote bag using a border fabric and mesh. Two of our favorite things! 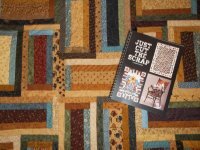 Need a gift to make that is quick and easy or maybe you are going on a vacation. This is one for you! Are you a scrap lady? If you are, you are going to LOVE this book. We just got this quilt completed and it was so much fun. We went through lots of scraps and of course, we still have lots to go. However, never fear, this book has many projects. We bet you can put a dent in that stash! This was definitely one we thought you would enjoy. Come in and ask for it. Remember, it is never to HOT to quilt! Just crank up the AC!